And on a completely different theme for today . . . When I discovered that Janet Halfman (click on her name to read an author highlight I wrote) was releasing a new book, I knew we would enjoy reading it! Star Bright Books sent a copy of her latest, Good Night, Little Sea Otter and in no way were we disappointed! Because it dealt with a subject matter that is near and dear to Bookworm1's (age 4) heart (i.e., sea creatures!) I hid the book upon it's arrival and pulled it out as a special treat. This book treat went over very well. It tells the story of Little Otter who is getting ready to fall asleep on his mama. But before he goes to sleep he must say goodbye to all of his friends on the water and under it - the harbor seals, the seagull, fish, snails and sea slugs. The illustrations by Wish Williams are rich and colorful and compliment the story well. The page spreads are full of ocean animals that the story is a feast for the eyes. Everywhere you look you discover another animal. Furthermore, you just want to snuggle Little Sea Otter who is all wrapped up in kelp. He is so cute! 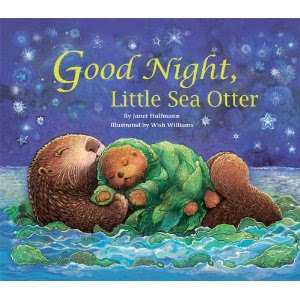 This is definitely a winner of a book, both from the perspective of being a bedtime story as well as a book to learn from, as you discover how it is that otters sleep safe and secure on the ocean waves. It is a very fun mama and baby read aloud book. Good Night, Little Sea Otter is adorable and we loved it! Thanks, Star Bright Books, for sending along a copy. Thanks to Janet Halfman for producing another story for us to enjoy. I like when books use a a different animal...as much as I love mice, it seems that otters are much more creative! That looks like a delightful book! Would be great for a preschool ocean unit study. Super cute! The theme reminds me of Goodnight Moon? :) I'm adding it to my Amazon wishlist! Oh, and it looks like we're on for the first weekend of March... I'll keep you posted and I hope I have a spare minute! Thanks for the wonderful review, Carrie, and for the nice comments from everyone who stopped by. Happy Dreams to All!